This article attempts to demystify what "cloud" means in the context of a point of sale systems. 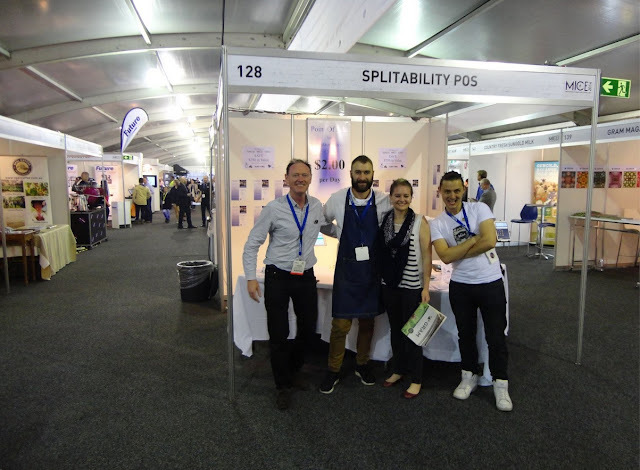 Just over two years ago we did our first trade show at Melbourne International Coffee. Our POS system had been in production for around a year, we had clients using it, but it was still quite a new product. This picture shows some of the cheery people in the stands that were around us. In 2014, most of the incumbent POS providers were of the "installed" variety and not big believers in the cloud. The initial entrants attempting to crack the online delivery model had yielded some spectacular failures and the existing suppliers were quick to point this out. It tainted the whole on-line space. Everyone has a Cloud based POS solution now! 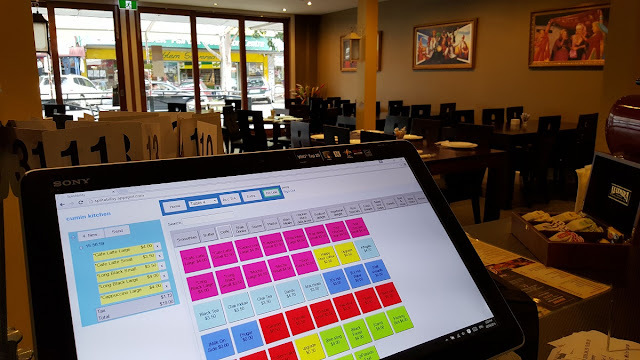 But what makes for a cloud based POS system? Ask five people what the cloud is and you'll get five different answers. There's an abundance of resources out there to explain the benefits of the cloud, so we're not about to repeat that here. So what exactly differentiates the various types of POS systems out there? Installed systems require on-site server hardware and software to operate. The software is proprietary and typically runs a version of the Windows operating system. These systems have been around since the mid 1980's when the Windows graphical interface first emerged. Remote monitoring of the data is done via an Internet connection however the software and data remain on-site, tucked away on the hard-drives of the local computers. These systems are mature and have been around since the birth of the PC. Are stable in operation, have been proven over many years of operation. Off-line operation is a given, installed systems are off-line by definition. Can be customized to the users requirements. Development for installed systems has all but ceased, it's yesterday's technology. You can loose your data in an instant. If your database is corrupted you'll need a full software reload. Are vulnerable to virus attacks. Usually sold with lock in contract arrangements. Customization comes at a high cost. Limited flexibility to change hardware or devices. Some items such as printers use device drivers that can be problematic. You're tethered to a particular operating system. Licences protect the vendor not the user. Maintenance is difficult as databases are on site. Switching costs are high and expose the buyer to price gouging. A composite mix of installed and on-line technology. Hybrid systems attempt to bridge the gap between installed and true cloud based systems. They achieved this by having locally installed hardware and software to do local tasks like ordering, printing, totaling etc. The local system ensures good speed of operation but once the transaction is completed the data is moved off-site to a cloud based data center. The process of continuously archiving the data off-site is done in the background and is transparent to the user. Data is safer than installed systems but not as safe as true cloud systems. Can be customized but not as easily as installed systems. Are only a stepping stone that precedes the move to fully blown cloud systems. Have an impending "use by date" and will eventually fade away. Can have issues with data synchronization. Installed components suffer all the same issues as installed systems. High operational and switching costs. As with the hybrid car, the true end game is to move to the fully electric car. The risk in choosing a hybrid POS system is that it may quickly become a thing of the past. In the short term, hybrids fills the gap. They don't have on-site server based hardware or software. Enabling software is held off site in data centers, it loads on refresh. Transaction data is stored off-site in a cloud data center. The Internet connects devices directly to the cloud servers. Peripherals devices such as receipt printers don't require device drivers. Off-line operation is on a per device basis. Play store and App store Apps are available for these systems but are a convenience rather than an essential part of the system. True cloud based systems can operate in a web browser. Many devices now have independent Internet connections e.g. smart phones with a data service. Being able to connect via any connection mitigates issues regarding Internet outages. This provides superior reliability (up time) over both installed and hybrid systems. Remote monitoring connects directly to the actual data stored in the data center. Is the focus of future development. Operates on many different devices, tablets, smart phones or computers. Your data is automatically safe and secure. Lower operating and switching costs. Various features are still being developed. If you don't like what the system offers, customization is not an option. Extended off-line operation is not recommended. Just about everywhere you look there is an article on how the cloud is changing things and is the way forward as it is more efficient, lower cost, reliable, has easy access to data, the list goes on. True cloud systems have all of these symbols displayed everywhere. It means the system is platform agnostic (can operate on all devices). Compared to the trade shows we did a couple of years ago, anti-cloud sentiment is fading as the online delivery model is being proven and becomes increasingly faster and more reliable. With new features constantly rolling out, the online model offers a compelling value proposition and that's why we're backing it over it's predecessors.